This is the history of the first branch of Jesus Christ of Latter-day Saints in Binghamton. My father Nephi Bingham, my mother Elizabeth Dalkin Bingham and six children; Rebecca, Mae, Clara, Glen, Floyd and myself, Edna; moved from Casa Grande, Arizona to Tucson in the spring of 1900. Tucson wasn’t very large at that time. It had one street called Congress Street, not paved, two grocery stores; Ivancovich, and Wheeler & Perry. The dry goods stores were Rosy’s and La Bananza and there was a watering trough for the horses. My father located a place called the Davidson Place north of the Rillito River that ran the year around. We lived there until the fall of 1904 when we moved to a place south of the river called the Bayless Place, then it was known as the Bingham Place. There was a wagon road leading from our home to Tucson, six miles away. There was only one house between our house and town. We called it the half way house. All we could see was catclaw bushes, sage brush, and chaparral. The ground was crawling with rattle snakes, Gila monsters, lizards, and tarantulas and we had to keep our eyes on the road to keep the horses from running away. There weren’t many Mexicans living near Tucson. My father had to hire Indians from an Indian village south of Tucson to help him harvest his crops, as he had land along the river six or seven miles from our home. We had Mormon Church officials and missionaries visiting us often. On Sept 9, 1909 my father and my two older sisters, Rebecca and Mae, went to Colonia Dublan, Mexico to visit his nieces and nephews who were the children of his sister, Melvina, and her husband Winslow Farr, who had died. My two sisters stayed in Mexico to attend college nearby. When my father returned from Mexico his nephew, Heber Farr, and his brother-in-law, Charles Hurst, came with him. They looked over the Davidson Place and decided to move to Tucson if it was agreeable with the other ones in Mexico. The families were agreeable and they all began to make their plans to move to Tucson and my father began to make plans to have plenty of food for them when they arrived. My father’s youngest brother, Jacob Bingham, lived near us and he made plans along with us. My father owned a dairy and had plenty of milk. He butchered a pig and cured it. We had turkeys, ducks, chickens and eggs, plenty of bottled fruit from our orchards, dried corn, beans, dill pickles, sauerkraut, pumpkins, five gallons of mincemeat, and a winter garden. A few days before they arrived, my father killed a beef. He would hang it outside at night in the cool air then take it down and wrap it in a sheet and canvas and lay it on a cement floor in the daytime to hold the cold in. On December 15, 1909, in the afternoon, eight covered wagons came rolling out of the catclaw and chaparral bushed down the lane to our home. It was a wonderful meeting to see them all for the first time. They parked their wagons between our home and Uncle Jacob’s home. Some of them were very sick when they arrived. The sick and the old people slept in the two homes and the others slept in the covered wagons and they all ate their meals in the two homes and would come and go as they pleased in the daytime. The people who came out of Mexico in the covered wagons at this time were the five Farr brothers; Heber, Joseph, Ernest, and their families, Wilford and Acel, not yet married. The sisters were Edith Webb and Lindy Young and their families and Mamie Farr who was not married. Some of the in-laws and their families also came. There was a small wooden school house near-by where all the children attended school. The men started building their little tent houses to use until they could build better ones. Heber and Joe remodeled two adode houses on their land north of the river. Most of the people lived on the south side of the river. After they were settled in their homes, the land cleared of mesquite trees and their crops planted, they all decided to dig and build reservoirs to store the water from the river that ran the year round. It supplied water for all the farms along the river. Plans had been made earlier with President Joseph E. Robinson, President of the California Mission, to visit with us. On Saturday morning, May 21, 1910, Heber Farr and my father met the train from Salt Lake and California to get George Albert Smith and Joseph W. MacMurrins and President Joseph E. Robinson. That afternoon my father, my mother, and my sister Clara, my two brothers Glen and Floyd, and myself were baptized as members of the Church of Jesus Christ of Latter Day Saints. The following Sunday afternoon, May 22, 1910, the first Branch of the Church of Jesus Christ of Latter Day Saints was organized, in the shade at the east of our home. The opening prayer was given by President Joseph E. Robinson. The new branch was called Binghamton Branch, after my father. There was already a little town in Arizona by the name of Bingham. Heber Farr was ordained Branch President, Fredrick Granger Williams first counselor and Frank Webb second counselor. We were all confirmed members of the Church of Jesus Christ of Latter Day Saints. The sacrament was passed, talks were given, and the closing prayer was given by Joseph A. Farr. Church services were held that summer under the shade trees by Heber and Joseph Farr’s homes. My father was county trustee of the Davidson school district. He received permission to have a large school house built as more Saints and relatives were moving out of Mexico. By September 1910, the school house was built and by adding the little school house to the south end of the new building there was room for a stage and two class rooms more. My father got permission to hold church services in the school house. At that time, the Sunday School was organized. Joseph A. Farr was ordained Superintendent of Sunday School, Elmer Cardon as first assistant, J. Alma Young as second assistant, Ellen Bluth as secretary, and Clara Bingham as assistant secretary. Heber O. Chlarson was set apart as ward clerk. The next Sunday, the ladies Relief Society was organized with Elizabeth Farr as President and Mae Bingham and Lindy Young as her assistants and Hazel Williams as secretary. Later, the Primary and Mutual was organized. More and more people were moving out of Mexico but they settled near Jaynes Station by the railroad tracks. They were clearing land for some company. There was a school house there. There were many young people living there in little tent houses and they would come to Binghampton to dances one Saturday night and we all went to Jaynes Station the next Saturday night. Some of the young boys living in Binghampton worked for my father on the farm and milked cows. My father furnished transportation for all of the young people in Binghampton to get to the dances. He had a large wagon and a hay rack on it and two spans of mules. The boys would fill the hay rack full of hay and stretch canvas over it and then some quilts. My father gave the drivers a little bell and said “don’t whip the mules, just ring this bell and they will go fast enough.” We had to make our own fun and enjoyment, and we sure did, going on picnics up Sabino Canyon and playing Run-Sheep-Run and Twos and Threes and attending Church services. After the land was cleared at Jaynes Station most of the people moved to Binghampton. Some went to Mesa, Arizona and some went to El Paso, Texas. When the Mormons living out of Tucson heard that there was a branch of the Church near Tucson they came from Safford, Thatcher, Duncan, Pima, St. David, Douglas and Benson. Gordon Kimball came from Safford to Tucson and worked in a bank. Later, his brother Spencer W. Kimball (now our Prophet) came and attended the University of Arizona. He drove a taxi to help pay his way through school. The Saints living in Tucson came to Binghampton to attend Church services, dances, entertainments, and home talent plays. Automobiles were being shipped by rail but the little dirt roads were still being used. A few years went by, the Ft. Lowell Road was paved to Cambell, then south to Speedway. The people living in Tucson and Binghampton when I was married in 1915 and left there were: Nephi Bingham and his family, the five Farr brothers Heber, Joseph, Earnest, Wilford, and Acel; the sisters were Edith Web and Lindy Young and Mamie and all their families (wives and husbands and children) and in-laws, Chlarsons, Clawsons, Browns, Bluths, Bilbees, Cardons (three families), Evans, Farnsworths, Lillywhites, Hardys, Dones, Obegs, Headers, Jespersons, Johnsons, Paynes, Nelsons, Roleys, Stocks, Jones, Merrits, Youngs (three families), Winns, LeBarons, some more Johnsons, Prices, Tompkins, Williams, Webbs, Wheelers, some more Binghams from Mexico, Butlers and all their families. 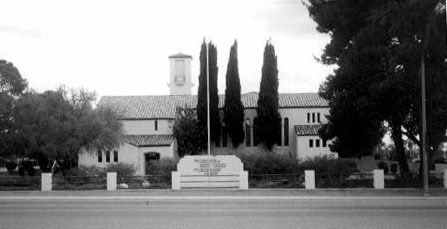 In 1928, the chapel was built on Ft. Lowell Road. I visited over there very often. The last time I was to Church there was in 1965 and it had been remodeled. There are only three members now living in Binghampton that was present when the Church was organized. They are my brother Floyd Bingham, Milda Farr Jones, and Thelma Young Golstine. I have enjoyed writing this history, but I forgot one thing. If Fred Sabin hadn’t come from St. David to Tucson my name would not be Edna Bingham Sabin.